It's been awhile since I've posted a house update - if all goes well (and it should), we'll be exchanging contracts and so forth this week, and we'll get the keys on Thursday! It's an exciting time for us :) Our boxes arrived yesterday, and we've started doing what we can packing-wise... which led me to find some very interesting things today. I love finding old treasure that I forgot I had. Let me give you the backround story to this picture. When I first moved to England (6 years ago! wow) my husband had rented us this cute little furnished flat on a short-term basis. I'd brought lots of my things over from America, and we had lots of souvenirs and things from our travels, so we made things home-y pretty quickly. It was nice. I liked it there. 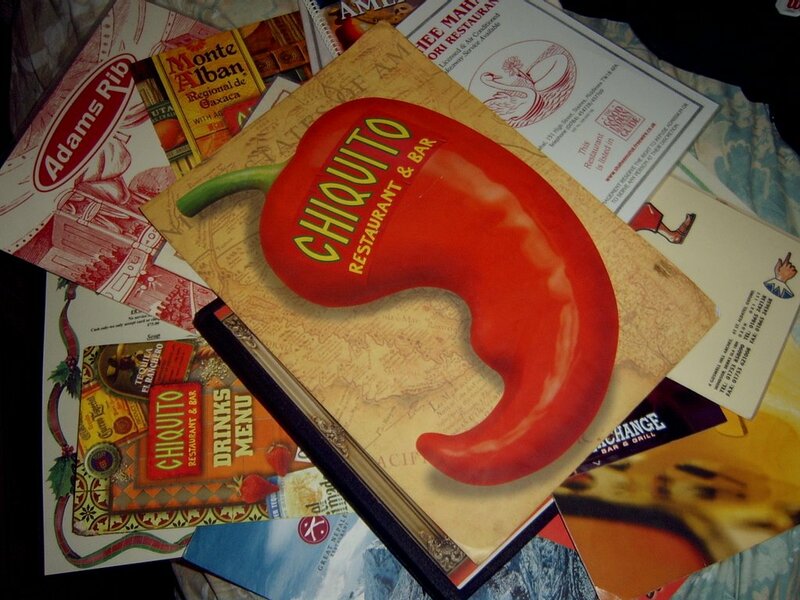 For some reason or another, my husband had a MASSIVE Chiquito's menu he'd acquired, and I had a brain wave one day, to stick this colourful menu on the windowsill. Ooh, a simple way to spice up the boring kitchen! It started a little fad. Now I don't like to say we STOLE the other menus, but yes, we did - until I ended up with no space left on my windowsill and years later, I find way too many 'borrowed' menus in a bag crammed on the top shelf of a cupboard! Mr. Merriweather: Oh, you study numerology? Mr. Merriweather: I'm a 1. Lucy Ricardo: I'm a 3. Ricky Ricardo: I'm a 5. Mr. Merriweather: We're all odd, aren't we? Make sure you take a picture of the house keys and post it :-) Congrats since I know all is going to go well. We'll still dealing on ours and have to go talk to the owner hopefully this weekend when my sister in law can accompany us. And you're not stealing menus. Aren't they there for the taking?